No Cash? Running to find a functional ATM near your location? Then here's something which can come to your help. Walnut is an ATM finding App that shows all the ATMs near you, and which one is currently active with the current currency notes. To know more, read on. During these harsh days of demonetization in India, locating and finding out an ATM with cash is no less than finding a jackpot. When all the social media posts were busy discussing only about this, one of the posts came out handy with this useful link, where I first heard about the Walnut App. The App isn't only helping you finding an ATM near you, but it even shows which of them are currently dispensing cash and how long the queue is along with the time it has been active. That appeared to me as an app that understood the need of the hour, and at this moment, I couldn't resist trying it out. And what next? It really worked! 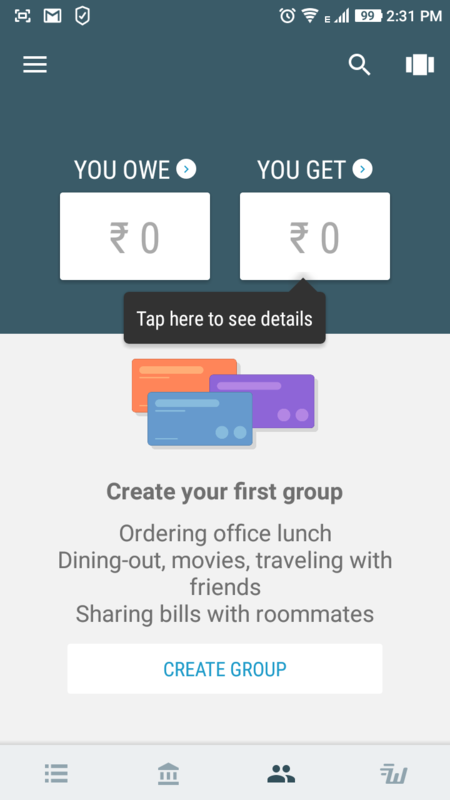 It is free and available on the Google Play Store, and now it is a regular usage app for me as it handles my expenses too in these crucial days of cash crunch. The app has a few basic features that work together as a fantastic combination. It shows the location of all the ATMs near you wherever you are. Moreover it even shows which of them are active and since how long. What more it even lets you know if the queue is a long or a short one. It verifies the information through the latest users who have just successfully withdrawn cash from an ATM. It even sends you notifications if you want to know if any ATM close to your location becomes active. They say that for a number of selected ATMs, it can even let you know if it has Rs. 100, 500 or 2000 notes. But till now I haven't received any notification on this. On the other hand, the app is your expense manager too. It will handle your expenses and track back how much you have spent today and where. It would even show your monthly expenditure and remind you in time, if you have any payments due. Walnut works on the basis of analysis that it does from your Messaging Inbox to track down the amount that has been spent in retail stores, through internet banking, card payments and ATM withdrawals. It can Automatically track your bank, ATM transactions, debit or credit cards and bills paid securely without accessing any bank passwords. And it does so simply by analyzing your Messaging Inbox in your phone and finds out the relevant information like bills expenses, and tickets that come from the merchant numbers. But don't worry, Walnut would not read any of your personal messages that come from a 10 digit mobile number. There is even an option where you can manually enter your cash expenses to and create a budget to follow. Through GPS, the app finds your location and based on the aggregated Walnut user inputs and transactions, they are efficiently able to show if there is any ATM near you with real time activity. The app even sends you a notification if any ATM comes live with cash, if you ask it for. The app tracks automatically on 'How much', 'Where' and ' On What' you have spent. But to make it work successfully, you have to make sure that you enter every detail manually whenever there is a cash transaction. If you forget, don't blame my favorite app! 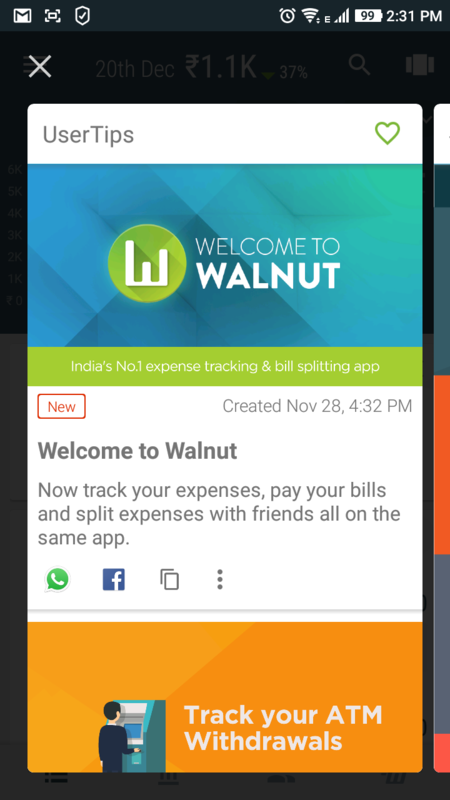 Through Walnut now you can split your expenses with your friends and family. So planning for an event is now just fun as everyone can share the financial responsibility. Walnut allows you to transfer money to any of your peers for free. You can send money directly to their bank accounts, with no more money getting stuck in your online wallets, and you are free from recording their account numbers and IFSC codes once you are equipped with Walnut. One of the coolest features that works perfect for unmindful and disorganized people is the Reminder and Notification. It would send you an alert whenever any payment is due, like your credit cards or electric bill and you can pay them off directly from the Walnut app itself. You can generate your expense reports and export them to your preferred location and save them for future references in .xls and multiple formats. Till now Walnut has more than forty Banks and cards supported in India. So if you have an account among these, you can check your bank account balance through this app without typing your id and passwords each time you do. 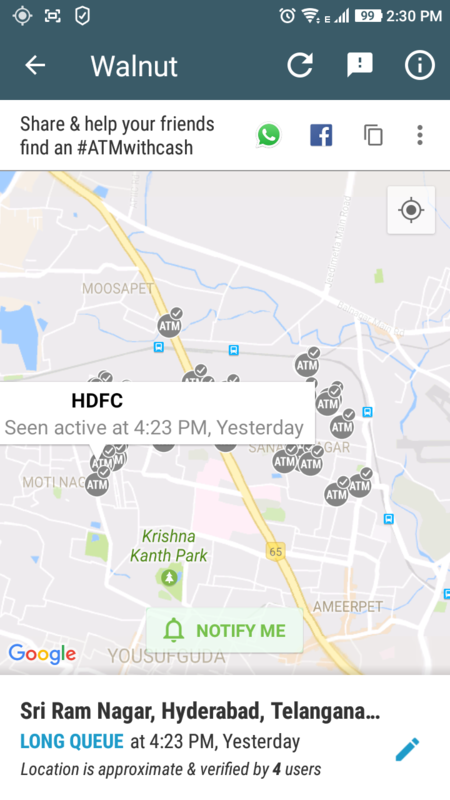 The App is working just fine with locating the nearby ATMs and it shows the ATMs in green and orange which have been active. It lets you know how long the queue is and when was it last seen to be active. It is a big umbrella app with all your money transactions put together. And if you are not using cash for big transactions, you need not input anything at all to track your expenses. The app will do everything for you. For this make sure you have enabled your SMS alerts for every online and digital transactions. To make your Walnut App work, you do not need any internet connection, as it works completely offline and only through SMS alerts. The alerts sent from Walnut are immediate. The app has its Backup and Restoring feature in place. Every transaction is categorized under three headers : Overview, Accounts and BIZ Messages. Could find any negative feature as of now. But one or two more things could make it even better. a) All the banks should be wired with this app. b) The app is still dependent on the user for its ATM finder verification, which is the only drawback of this app. A tie with the bank authorities and updates from them through an automatic procedure could have made the app more trustworthy. c) The App should be upgraded as a widely accepted payment gateway through which the retail stores can accept payments. At this juncture it would be highly useful for Indian citizens to go cashless. With so many financial apps working around, I found this app to be really advanced and useful, particularly at this hour of need. It has made life easier when all of us are forced to dedicate a huge amount of time and energy for ATMs. The app takes you directly to the ATM where there is the maximum possibility of you receiving the required cash amount. As it even shows the nature of the queue, you can plan your day well, and work on your convenience. 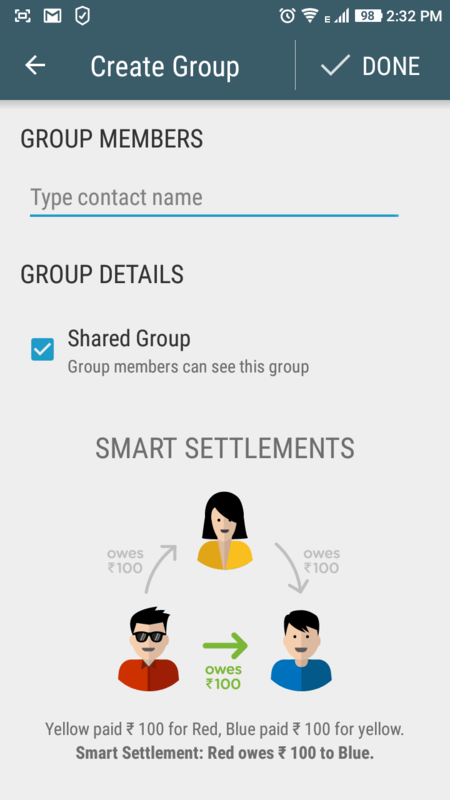 As the app is a money manager, you can set up a customized budget and follow it. as you can even pay your bills through the app and transfer money to bank accounts, you are definitely saving a lot of time and effort with this app. To sum up, it is an app that makes you more aware and efficient with your money through the day.